In Nebraska, real property can be transferred from one party to another by executing a quitclaim deed. 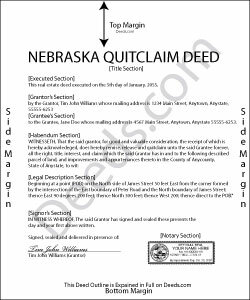 Quitclaim deeds are accepted, but not statutory in Nebraska. A quitclaim deed offers no warranties of title. It does not guarantee that the grantor has good title or ownership of the property, and only transfer the grantor's interest, if any, at the time of execution. They are typically used for transfers between family members, in divorce proceedings or other transfers of property pursuant to court order, or to clear title. A lawful quitclaim deed includes the grantor's full name, mailing address, and marital status, and the grantee's full name, mailing address, marital status, and vesting. Vesting describes how the grantee holds title to the property. Generally, real property is owned in either sole ownership or in co-ownership. For Nebraska residential property, the primary methods for holding title are tenancy in common and joint tenancy. A grant of ownership of real estate to two or more persons is presumed to create a tenancy in common, unless a joint tenancy is expressly stated (Neb. Rev. Stat. 76-118). Sign the deed in the presence of a notary public or other authorized official. In Nebraska, both spouses must sign the deed to release any marital rights, regardless of whether or not the spouse holds a direct interest in the property (Neb. Rev. Stat. 40-104). For a valid transfer, record the deed at the recording office in the county where the property is located. Contact the same office to confirm accepted forms of payment. This article is provided for informational purposes only and is not a substitute for legal advice. Contact an attorney with questions about quitclaim deeds, or for any other issues related to transfers of real property in Nebraska.